Bad news for fans of Cheerios and General Mills, Inc. (NYSE:GIS) shareholders. General Mills stock fell to the tune of nearly 10% in response to earnings. GIS delivered a decent third-quarter report. But its profit outlook is lackluster — and could coincide with rising breakfast cereal prices. Cereal costs are on the rise across the board. Even rival packaged food players like Campbell Soup Company (NYSE:CPB) and Kellogg Company (NYSE:K) fell on Wednesday following the report — with traders presuming they’re facing similar headwinds. General Mills, however, is largely being pegged as the biggest victim of increased operation and production costs within the food arena. 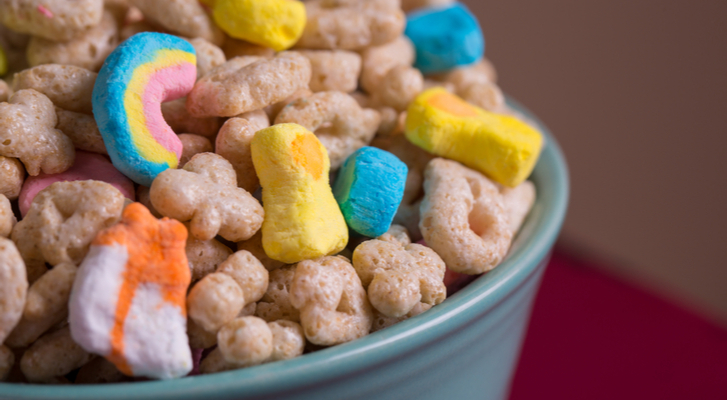 For its Q3 ending in February, General Mills turned $3.88 billion worth of revenue into an adjusted profit of 79 cents per share. Revenue was up 2% year-over-year, while earnings were up 10%. More important though, operating profits fell 6% on a constant currency basis. Whatever the case, the top line was better than the $3.87 billion analysts were collectively expecting. And the bottom line was just a hair better than the profit of 78 cents per share of General Mills stock analysts had modeled. General Mills’ business in Europe and Australia were notable problem areas. Though revenue was up 11% for the two markets, operating profits fell 36% mostly thanks to rising input costs. Profits generated by convenience stores and food-service customers also fell 10% due to inflation. Last quarter’s shrinking operating profits may only be a taste of what’s to come if investors take General Mills’ outlook at face value. Full-year organic net sales are expected to be flat versus a previous growth outlook of 3%. Meanwhile, its operating profits are projected to fall between 5% and 6% on a constant currency basis thanks to higher operating and input costs. And analysts have taken notice. Three of them (so far) have lowered their price targets on General Mills stock, with RBC Capital Markets justifying the response by suggesting future GIS earnings would be “disproportionately impacted” by increased shipping costs related to ferrying goods from one facility to another. General Mills is responding, aiming to cut costs by improving its distribution network and tweak margins where it can. That may create little benefit though, given that it has little control over the price of things like fuel and freight. Analysts are also unsure that the company will be able to pass along more than a small piece of its cost increases along to consumers without losing them. The headwind General Mills is running into is neither a new one, nor surprising. Freight prices ebb and flow, as do commodity prices. It’s a bit unusual to see both costs swell so much at the same time, but General Mills has seen and survived worse. Time brings all things into a sustainable balance. It’s the “in the meantime” that can make owning General Mills stock a challenging exercise. Trapped between competitors, suppliers and the transportation industry as well as distributors like Walmart Inc (NYSE:WMT) that are increasingly pushing their own private-label brands, General Mills is in a less-than-compelling position. Article printed from InvestorPlace Media, https://investorplace.com/2018/03/no-prize-bottom-general-mills-earnings/.